As a Catholic, I am forever cursed with guilt, but I like to think that with age Catholicism’s grasp on my soul gets a little less tighter and perhaps free-will even enters the picture at some later date. I am somewhat caught in a weird loop when it comes to religious matters. It is not that I don’t believe in God, it is that I don’t really think it matters. As part of Generation X, I tend to be pretty cynical in nature and just like everyone else I went through my whole depression stage (remember when everything in your closet was black? ), but now I’m older and my biggest fight isn’t with God, The Catholic Church, parents, or even my own kids, it is actually with myself. It is always been about me! In a sense that is what religion is, it is me! However, I am not perfect, and the religion of me, is not that I am God, it is my connection to the world. What I feel, who I think I am, what I want to be. In this it is not that I have been searching for God at all, it is that I wanted to run away from myself. Most religion tries to fill a void and give you some direction and possibly some really strange believes, (like worshiping a guy who had his disciples drink his blood and eat his flesh does not sound strange enough? ), but for me personally the perfect religion for finding yourself is really Buddhism. It is the only religion that allows you to live your life in moderation, to have discipline, to know yourself. Now, I am not saying you should be a Zen Buddhist tomorrow, and I for one find it incredibly hard to give up eating beef, however Buddha really made some great points about the human condition. I wont go over any of them, cause you need to experience them for yourself in your own time. The only thing I will point out is that not all Buddhism is Zen, and in actuality Zen is a pretty strict version of Buddhism, so I personally would not start there. I seem to remember Jack Kerouac saying something about how he was a Catholic Buddhist, and for the most part that is exactly what happens. You can not totally change your religious upbringing, but you can get to know yourself better and Buddhism is one way to do it. Over the weekend I dropped by a local BestBuy to take advantage of one of their 10% off coupon deals, when I saw three people standing in the software isle looking perplexed at the retail software packages. I felt a sudden urge to help these clueless customers who actually have no idea how clueless they are. I should have kept my mouth shut, but I was in one of those incredibly helpful moods, so I strolled over and told the woman holding the yellow box software what I thought of that very software. Which is that the anti-virus scanning is incredibly slow and that it conflicts all the time with business software, and that I recommend to all my clients that they not purchase it. Instead I recommend CA EZ-AntiVirus which is very easy to use, does not slow down Windows, and is cheaper. However from the look she gave me, she did not believe a word I told her and claimed she had been using the yellow box brand for years. To which I told her, I have only worked in technical support for about ten years and I wished her the best of luck. The whole experience made me think of just how terrible customers really can be at BestBuy. I should know, I worked for them back when I was college. Back then we use to joke around how clueless BestBuy customers really are. I did not work in computers but in the audio department, and as bad as I saw the computer guys lie to customers, I equally was overburdened with the everyday rudeness and plain ignorance of some customers. One day a couple in their late forties showed up wanting to buy a rack audio system. Shannon was free, and helped them right away. She must have spent twenty minutes going over their options and which system they should get. In the end, Shannon wanted to kill the woman, because she kept interrupting Shannon and made it pretty clear that she did not want a female salesman. I had to go over and repeat the same recommendations as Shannon and they left with the same system that Shannon recommended. We always had one person during the week that would come in wanting to look at our most expensive item. This was a $2000 receiver which we had to special order. After showing them everything, they would complain that the price was too high and say we sucked, and how they would just buy their stuff at this other place. There was never any sale and they never knew anything at all about audio products, but they always thought they knew everything. As for our products, we sold consumer oriented products and we even had some nicer units for a reasonable price, but we were not a high end dealer, because top tier products like the Sony-ES series are not mass produced like Sony’s cheaper main consumer lines. If you were into audio high end products you would never walk into BestBuy, those types of customers only came to us when they needed Monster cables or accessories. What happens though with the majority of sales is that if you are an honest salesman, which I was, you try to help people buy what they need and what they can afford. Most people have either a bottom-up or up-bottom approach to buying stuff. They either want to look at one extreme of the price range and try to pick something a little bit better or cheaper based on what they look at. This is what smart people do. But remember not all customers are smart. Many people would ask for your recommendations and you would show them three products from multiple brands or if they had a specific brand in mine like Sony or Panasonic, I would show them two of the brand they wanted and one other brand to use as a comparison. After asking them some questions, I would arrive at a final recommendation that they could look at again and decide on. The smart customers would end up picking what I recommended and the truly ignorant would tell me to go away and they would pick up the cheapest unit they could find and return it a week later! Many customers learned the hardway that I was not trying to sell them anything, I was trying to show them what they needed, based on what they told me. This is not to say that there are no bad sales people out there, cause there are, but people have to think about how good a customer they really are? Do you honestly tell your salesperson what you want and need? Many times the best way you can get a deal is to walk up and ask and say I want a deal, what do you have and why is it a deal? Customer service is a lost art, but just because no one cares anymore, does not mean the customer can just ignore their responsibility. If you go out to eat regularly, the staff there should know you and welcome you. If you are not getting the extra attention, it usually means you are not tipping correctly. When I go to a department store and someone checks me out fast, I thank them and if there supervisor is there, I let them know I appreciated the fast service. Companies are always looking for feedback, they want to sell more and they want to be known better. If good service is never recognized, then it is never rewarded either and that great salesperson will most likely be gone! Believe it or not, being a nice customer also has its rewards. Many restaurants discount meals or throw in free drinks, salespeople often special order items just for you and let you know when to come back for a sale. We had some excitement at the office yesterday. It seems that whirling sound coming from the ceiling vent fan was more than just annoying, it was a sign. As usual if you don’t head any of the warnings, life has a way of getting your attention in the darnest ways. 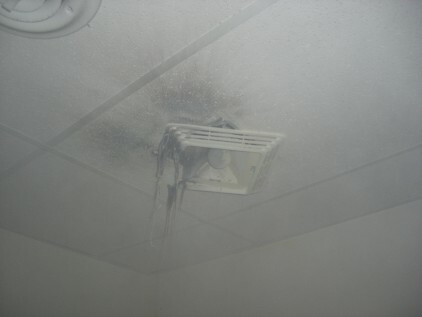 In this case, the fan just burst into flames and we ended up going all fire extinguisher on it. The results make for an interesting picture.